What Is Pimento & The Iconic Cuisine ‘Pimento Cheese’ All About? A pinch of this heart-shaped pepper is a delight to the heart. 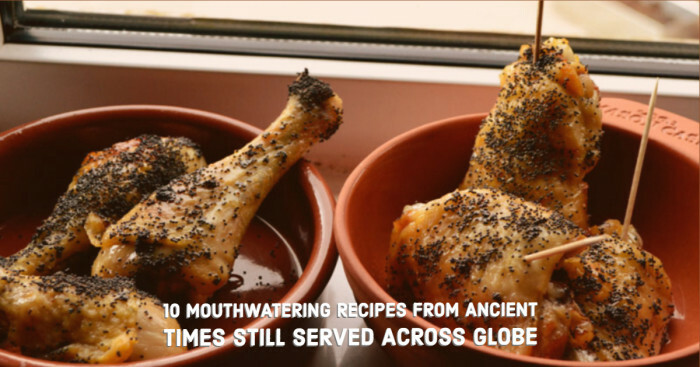 It is all you need to add a unique flavor to your bland food and spice up your life. And it appears that this pepper’s life purpose is to garnish the cuisines and make them more palatable. Know pimento at a deeper level. Read about its pungency level, stuffing, an iconic cuisine ‘pimento cheese’ made from it and a lot more. Pimento or pimiento or cherry pepper is a kind of small and red chili pepper having a heart shape. Coming to its size, pimento is 3-4 inches (7-10 cms) long and 2-3 inches (5-7 cms) wide (medium, elongate). The Pimento’s pulp is found to be sweeter in taste and more succulent and aromatic than a red bell pepper. ‘Floral Gem’ and ‘Santa Fe Grande’ are two of the hot varieties of pimento. 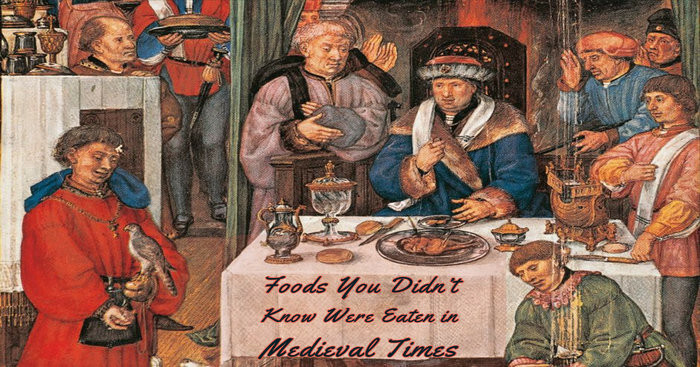 They are mostly used in fresh or pickled form. It is one of the lowest rated chili pepper on the Scoville scale. (add a snapshot) Catalonian scientist Danielia Chenia and his food science students at the Aronyable Study Center for Taste and Nutrition describe its taste as the 'reminiscent of a mild onion and garlic pickle'. What Do People Across The World Call This Pepper? Since the pepper is small and red, it is named so. Originally a Spanish term, ‘Pimiento’ is a loanword that was added to English. In Portuguese, bell pepper is known as Pimento. ‘Pimenta’ is referred to as peppercorns in Portugal and Portuguese-speaking Asia & Africa. ‘Piri Piri’ or ‘Malagueta’ refers to chili peppers in Portugal and Portuguese-speaking Asia & Africa. 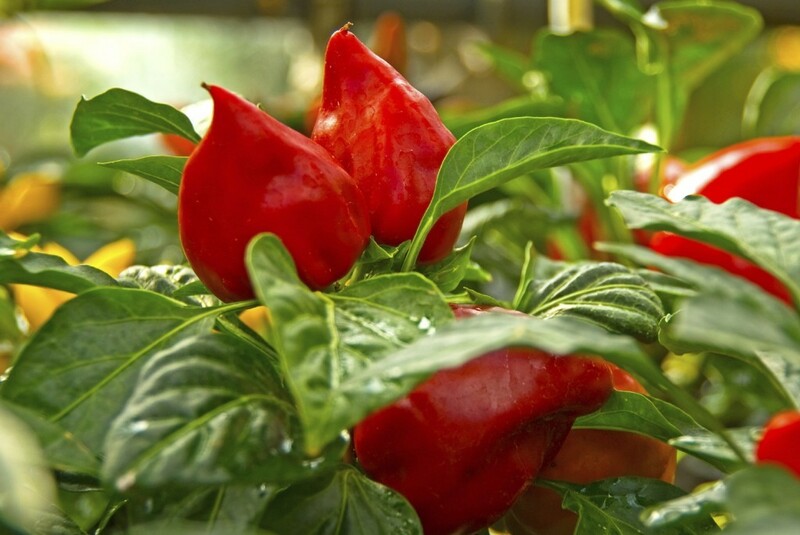 In Brazil, pimenta is referred to as chili pepper and ‘malagueta’ refers to its hot, small variety. ‘Pimenta-do-Reino’ or [Portuguese] Kingdom's pepper is referred to as peppercorns. 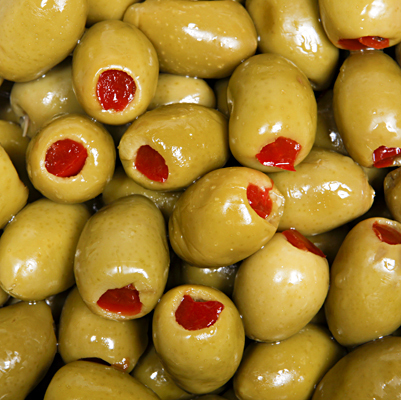 Until the early 1960s, the pimentos were hand-cut and were manually put inside the olives. This method was very expensive and time-consuming. It was in 1962 when the Sadrym company of Seville, Spain ushered in the first automatic olive-stuffing machine. The company happens to be the largest manufacturer of this machine in today’s time. The majority of the pimento-pushing machines are still manufactured in Spain despite the fact that Spain’s favorite olive insert is anchovy. This automation of olive stuffing resulted in accelerated process and reduced manufacturing costs. In order to make the production easy, the pimentos are pureed and then small strips are made using natural gum (sodium alginate or guar gum). Sodium alginate is a preferable choice rather than guar gum as the latter may cause a reaction on the consumers who have peanut and legume allergies. 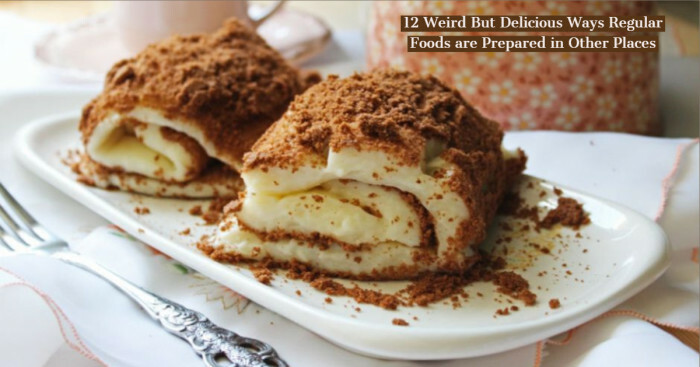 The highly advanced pimento-pushing machines use a combination of mashed potatoes and a gelatine mixture that is assembled into large sheets. These sheets are sliced into strips and placed inside the stuffer on the large rolls. Firstly, a plug of pit size is cut in one end of the olive by the stuffing machine. Then, the pit is pushed using an X-shaped punch on the olive’s other end. 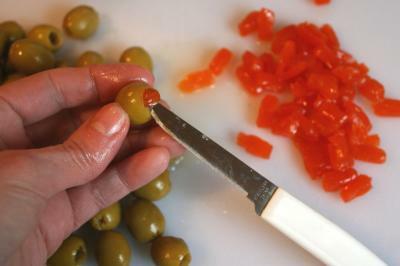 After this, the pitted olive is transferred to the next station where a pimento strip sliced and put inside the cavity. What’s Better Than A Sweet Pimento To Balance The Strong Salty Flavor Of Olives? The strong and salty flavor of Spanish green olives required the sweet red pimento to be stuffed into it in order to balance the taste. The fresh green olives are originally quite bitter in taste so they are treated in brine to get rid of this taste before they are packaged. Pimento is either mixed with cheese or put inside green olives. In the US, pimento is a popular addition to cooking a more flavorful dish. Other than stuffing and garnishing, Pimento is used for the preparation of pimento cheese. Pimento loaf which is a kind of processed sandwich meat is also made using pimento. 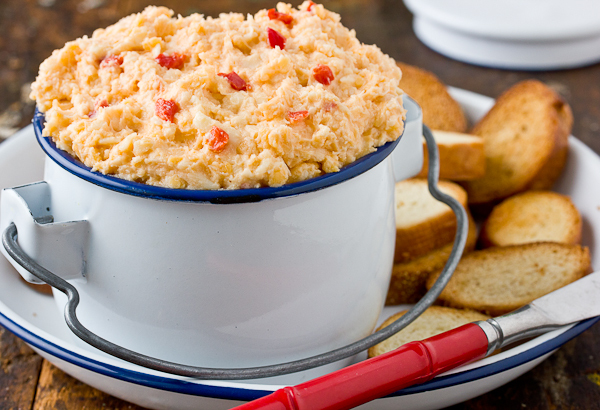 The “Caviar of the South” and a major “Southern institution” is what Pimento cheese is fondly known as. Basically a spread or seasoning prepared using cheese, it happens to be a quintessential Southern food. 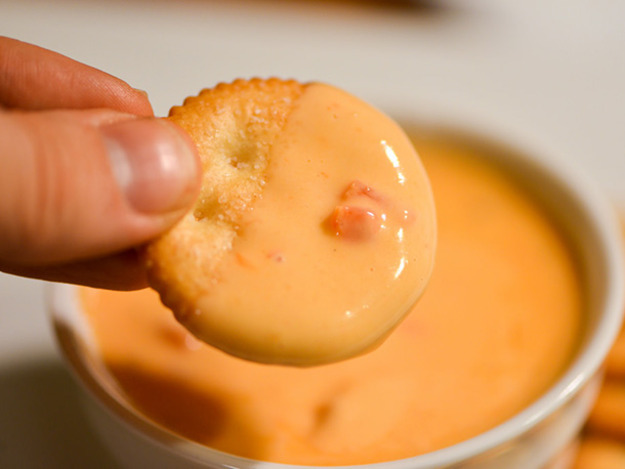 Mayonnaise or salad dressing and sharp cheddar cheese or processed cheese (such as Velveeta or American cheese) are mixed with pimentos to prepare a basic recipe for Pimento Cheese. The paste could be smooth or chunky. The regional ingredients mainly include Worcestershire sauce, salt, and pepper, Louisiana-style hot sauce, onions, cayenne pepper, jalapeños, garlic, cream cheese, dill pickles and paprika. The dish is either served as a spread on crackers or scooped on celery with tortilla or corn chips mixed in mashed yolks. They may also be spread over hamburgers or hotdogs. Being a quick to prepare lunch that’s also easy on the pockets, pimento cheese sandwich can either be rolled up and cut into pinwheels or served as a cocktail finger food. In the Philippines, it is served as a common snack known as ‘Cheese Pimiento’. Pimento cheese sandwich is a distinctive food item at the Masters Tournament. In 2013, the change of food supplier for Masters by Augusta National Golf Club sparked a small controversy. As a consequence of this, there was a significant change in taste as it failed to replicate the taste. Interestingly, the 9th episode of the American TV crimes series “Better Call Saul” Season 1 was named as “Pimento”. That’s because the fixer Mike Ehrmantraut carries a pimento cheese sandwich rather than a weapon to his bodyguard job. To justify that, he utters the adage that pimento is the “caviar of the South". The episode writer Thomas Schnauz accepts that the adage was obtained from Wikipedia. And have you watched the episode “Cornered” of yet another famous American TV crime series “Breaking Bad”? If you have, then you might be able to recall the moment when Mike offered a pimento cheese sandwich to Jesse Pinkman when they go out on a stakeout together.